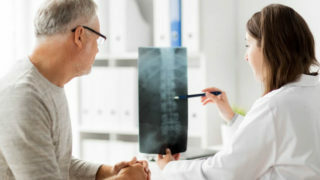 Endoscopic surgery has special applications for treatment of spinal problems particularly in the thoracic spinal column. Where endoscopic procedures for cervical and lumbar disorders have limited and less predictable outcomes, thoracic disc and spinal problems are often treated most successfully with minimally invasive “thoracoscopic or VATS (video-assisted endoscopic thoracic surgery).” Dr Johnson has been one the pioneers in developing endoscopic spinal surgery and in particular thoracic spinal procedures and has published widely and lectured on the treatment of disc herniation, spinal cord compression in the thoracic spine. 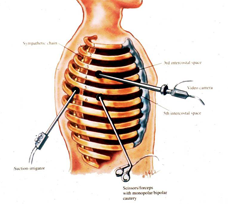 Kasimian S, Johnson JP: Endoscopic Thoracic Discectomy. In: Vaccaro A (ed) Atlas of Operative Techniques in Spinal Surgery, Elsevier, New York, NY, 2007. Johnson JP. 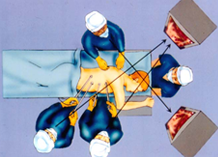 Thoracoscopic management of thoracic discectomy. In: Kim DH, Fessler RG and Regan JJ (eds) Endoscopic Spine Surgery and Instrumentation, Thieme Medical Publishers, New York, NY, 2005, pp 111-124. Oskouian RJ, Johnson JP, Regan JR: Thoracoscopic Microdiscectomy. Neurosurgery 50(1):103-109, Jan 2002.